It’s time that you practice your plastic smile and prepare to impress and influence the popular courtiers. You’ll work with them to gain social position and block your rivals from gaining influence any way you can. Lie, cheat and steal your way to power. Your influence will come and go quickly, as your rivals will work to impress and bribe their way into your position within the social structure. 2 to 4 players compete for recognition in the royal court. Your job is to manipulate the levels of power and grant favors to to important people throughout the different social structures. You’ll earn points for every completed petition card and you’ll earn additional bonus points from cards and abilities. The winner is the player with the highest score at the end of the game. Each player will take a set up wooden cubes in their chosen color. These will act as your influence markers throughout the game. Each player will place one of their cubes on the score track on the right side of the board. Each player will keep 15 of their influence cubes and place the rest in to the reserve with the white neutral cubes. You’ll shuffle the petition cards and deal one to each player. This will serve as your secret petition (mission) for the start of the game. You’ll take the next 4 petition cards and place them face up near the board. These are the public petitions that everyone can try to complete. The rest of the petition cards form the petition deck, which such be located near the board. Remove the ‘The Queen is Arrested’ from the Fashion cards. Shuffle the cards and make two stacks of 6 cards. Place the rest back into the game box. Now take ‘The Queen is Arrested’ card and shuffle it into one of the 2 stacks of cards. Place the other stack on top of the one you shuffled the queen deck into. Shuffle the influence deck and the power decks and set them beside the board. Flip the top card of each deck face up beside it, thee cards will be available for purchase during the game. Take each Coterie Ability Card and set them near the board. The board consists of 8 areas. The Senate, The Royal Family, The Minister, The Church, The Military, The Commerce, The Culture and the Antheneum. Each providing a different benefit if you have the most influence in that region of the board. These 8 sections collectively represent the Royal Court. Within each coterie, there are key people that players can influence. Each person has one or more spaces to represent how easily influenced they are. The more spaces they have the harder they are to influence. You will start the game with a limited amount of influence markers (wooden cubes), and can acquire the rest throughout the game. You place your influence markers by taking them from your pool and adding them to a courtier on the board. No influence, you can’t place. When you gain additional influence, you’ll take the markers of your color from the reserve and add them to your influence pool. If you spend influence, you take markers from your pool and place them back into the reserve. If you have no markers left in your pool and you need to spend influence, you must pull one off of the board. So how do you play? It’s simple, you play cards in your hand to place influence markers on courtiers on the board. Enough influence on a particular court gives you control of that court and a special ability. Once you have enough influence on particular courtiers you can complete a petition and score an amount of points. There are particular cards that will break the basic rules of the game, as in most games, the text on the card always overrides the basic rules. For your first game, you’ll being with a starting hand of 3 influence cards and 2 power cards and can jump right into the game. If you’ve become comfortable with how the game works, you’ll start the game with an opening auction. The auction is easy to complete, so we’re going to skip over this to cover more basic game play. On your turn, you can take one of 3 options. 1. Play an influence card or power card, completing the ability listed on the card. 2. Discard any or all of the cards in your hand. 3. Gain one influence marker from the reserve. Once you’ve completed your action, you can complete on eligible petition. Then finally refill your hand back up to 5 cards, choosing from any combination of the influence or power decks. After your turn, play proceeds to the player to your left. Playing cards and placing influence. As I mentioned there are two types of cards, influence and power. Influence cards will expand your ‘sway’ over the royal court, while power cards alter the board position to your advantage. When you place an influence marker , place in on an option position on one of the courtiers. If there are no empty positions, each influence marker can replace another marker. You choose whether you want to replace a neutral marker or another players marker. The influence marker you replace goes back to the original players resource pool. Refilling your hand. At the end of your turn, you refill your hand back up to five cards. You do this by drawing cards one at a time from either the power of influence deck. You can take the face down card from the top of the deck, or spend 1 influence marker to take the face up card next to the deck. If you choose to take the face up card, replace it with the next card from the deck before you draw another card. If (more likely when) one of the decks runs out, just shuffle the cards already played to rebuild the deck. Completing Petitions. You may complete one petition per turn and only after you have taken one of your actions, but before refilling your hand. It can be either your secret petition or one of the public petitions. You will complete a petition when each courtier listed on the card is completely filled with influence markers and you control each of the courtiers. (Meaning that you have the most influence cubes on each courtier). When you complete a petition, you will remove all influence cubes from each of the courtiers used to complete the petition. Players regain their influence cubes, while all neutral cubes go into their reserves. Place the completed petition card face down beside you to track your points. You do not move your marker on the scoring track, that is only used to track points acquired by means other than by scoring petitions. You then draw another secret petition card, or replace a public petition card if it’s the one you completed. Once a petition is completed, you will flip the top fashion card. It will represent a happening within the royal court. Follow all instructions on the fashion card and move it face down to the bottom of the fashion deck. A player gains control of a courtier when that player has more influence markers on that courtier than any other player does. Players do not control a courtier if they are tied for control. Neutral markers do not count against control. By controlling a coterie you’ll gain abilities and each coterie of the board will provide a special ability. The Royal Family ability: Other players cannot use power cards to replace, move or switch your influence markers anywhere, with the exception of the Royal Family. Other players can always replace your cubes within the royal family. The Senate ability: Control of the senate is worth a bonus of 10 victory points at the end of the game. The Church ability: When you play an influence card, you place 2 influence markers instead of one of that courtier. The Antheneum ability: Before refilling your hand, you may discard one card from your hand. The Culture ability: Score 1 victory point at the start of each of your turns. The Military ability: When you play a power card that has the military seal in the lower right corner, resolve the effects of that card twice. The Commerce ability: At the start of your turn, you may pay one influence marker to place one influence marker on any empty space. The Minister ability: When completing a petition, the minister can substitute for one other courtier (The minister does not need to be filled to use this ability). Doing so clears the minister of influence as normal. The game will end immediately when ‘The Queen is Arrested!” card is flipped from the fashion deck. All players will not add their victory points from their completed Petition cards and their Victory points gained throughout the game on the board. The player who controls the Senate coterie card will receive an additional 10 points as well. The player with the highest score is the winner. Courtier is a simple game to learn and a simple game to play. It plays out as an area control came that has a good amount of randomness to it. Your strategy will develop through the Petition cards that are face up, as well as your secret Petition Card. While you’re able to develop a strategy to try to complete petitions, it will really come down to your ability to manage the cards in your hand properly. Learning which pile to draw cards from and which courts that you need to control to get their advantages. While not technically a ‘filler’ game, it can be a quick play as long as analysis paralysis doesn’t factor in to one of the players decisions. I’ve played Courtier as a 2, 3 and 4 player game, all of them working effectively. The major difference was within the 2 player game, it was easier to gain influence in the houses that you needed because there were less players to compete for them. While it takes some of the difficulty and tension out of the game, it’ll still based in strategy and area control. Watch where your opponents are aiming for control and do your best to block out their strategies. 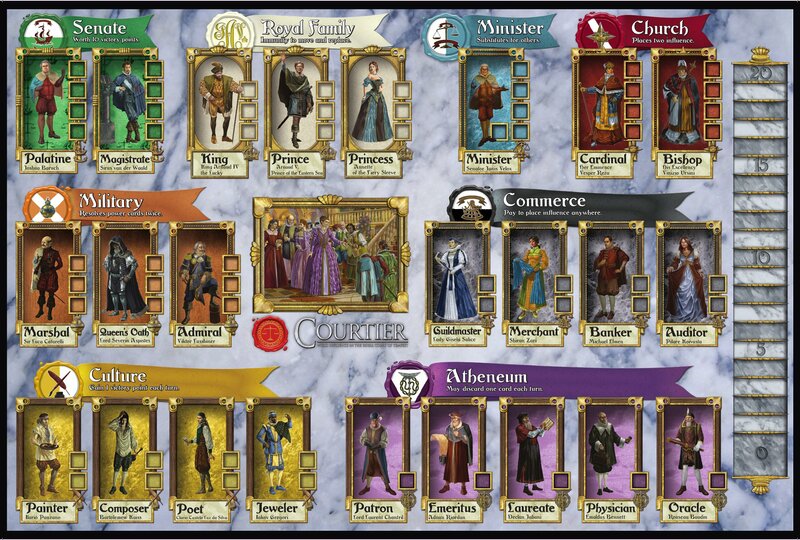 I’ve enjoyed Courtier, while it’s much lighter than the typical area control or worker placement that I look to play. It’s such an easy game to teach that I’ll keep it around to introduce new gamers to area control mechanics. It’s suggested for those looking to get into something a little heavier than the typical gateway games, without being bogged down by a heavy rule book or overly complicated mechanics.